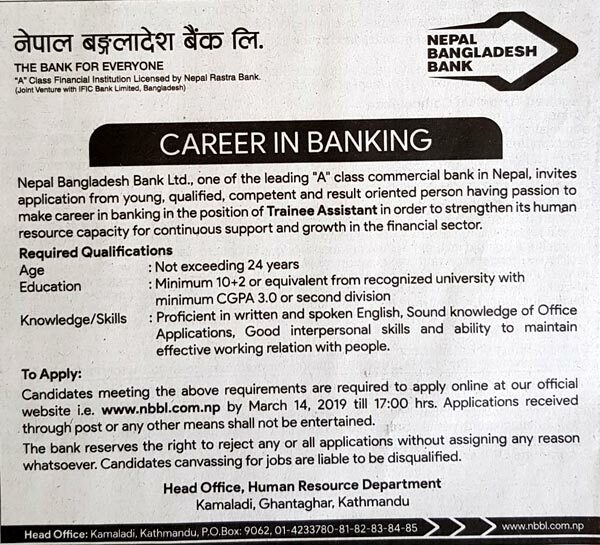 CAREER IN BANKINGNepal Bangladesh Bank Ltd., one of the leading “A” class commercial bank in Nepal. invites application from young, qualified, competent and result oriented person having passion to make career in banking in the position of Trainee Assistant in order to strengthen its human resource capacity for continuous support and growth in the financial sector. Proficient in written and spoken English, Sound knowledge of Office Applications, Good interpersonal skills and ability to maintain effective working relation with people. Candidates meeting the above requirements are required to apply online at our official website i.e. [ LINK HERE ] by March 14. 2019 till 17:00 hrs. Applications received through post or any other means shall not be entertained.